Are you considering ditching the stroller to try something new? Or have you used a baby carrier before and just don’t know which one to choose next? If you’re thinking of trying babywear for the first time, a Mei Tai is a great option. The Mei Tai carriers we will be looking at today originated in China. These Asian carriers tend to be square or rectangular, with straps attached, usually at each corner. They are available in so many cute prints too! Selecting a sling that will fit yours and baby’s needs is difficult, especially if you haven’t used one before. So, let’s look at the features of a mei tai compared to other wraps or slings. Whether you are an experienced babywearer or a complete novice, our guide will help you make the right decision. Use the links above to check the latest prices or read our in-depth mei tai carrier reviews below. To Mei Tai or Not to Mei Tai? The babywearing craze is taking moms by storm all across the globe — although it has been a tradition in some countries for centuries (source). With the growing popularity of babywearing in the U.S., the market can be confusing. There are many different types of baby carriers available, of all shapes, materials, and sizes. If you want a simple carrier that is easy to put on, comfortable to wear and safe for baby, you’ll love the mei tai. It’s a minimalist design, in between a wrap and a conventional buckle carrier. Less rigid than a conventional buckle carrier but easier to use than a baby wrap, mom and baby will love its comfort. One of the best points is that you aren’t limited to just using it in one position. The mei tai is versatile and adjustable enough to carry baby on your back, hip or front. Your baby simply sits in the mei tai’s body panel and you tie the straps around yourself. Young babies and small toddlers can be carried comfortably and safely, with even weight distribution for mom’s comfort too. With a little maneuvering, it’s even possible to nurse your baby discreetly, hands-free. However, this may be more difficult if you have larger breasts—sadly, something I was never endowed with, even while breastfeeding. One size fits (almost) all. You can easily adjust the mei tai to alternate between carrying baby and toddler. Or, when daddy wants to take a turn, the mei tai will fit him too. Ease of use: Is it easy for you to tie yourself? Or will you need someone there to assist you? Cleaning: Is it machine washable? This was a clincher for my Mei Tai — especially after being puked on with my previous sling! Material: If you are planning on a trip to Alaska in November, a carrier made from a cool summer fabric wouldn’t be the best! Organic fiber options are available too. 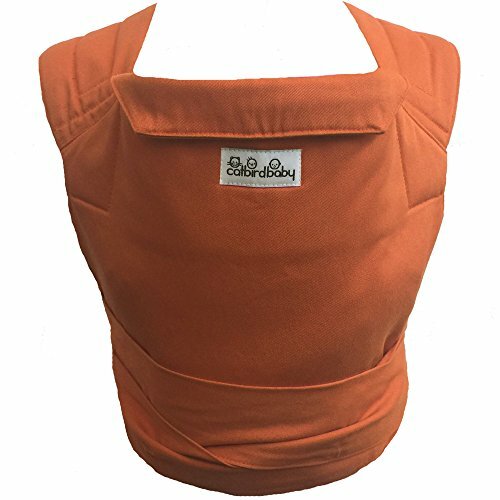 Sling fabrics need to be durable, breathable, provide ample support to both you and your baby/toddler, and be gentle on baby’s sensitive skin. Comfort: Is the carrier structured, or a soft material, allowing for baby to sit in as natural a shape as possible? How will it support your child? Will it support you in the right areas to counteract your child’s weight? Are ergonomic versions available? Safety: “Close enough to kiss” is a mantra stuck in many babywearers’ minds. Learning how to use your carrier to ensure your child is secure is important. Ability to carry other stuff: One thing I found was that I couldn’t carry my diaper bag across my shoulder, but just ended up using a backpack while the little one was on my front instead. Mei Tai carriers are made from soft materials and have a structured back panel for your child. They have straps which are pulled around the wearer’s waist and shoulders, before being tied in a knot, securing it. These carriers are more versatile than other slings on the market as you can tie them in multiple ways. If you like, you do not need to have your little one snuggled into your chest. Children can be carried on your hip, or even on your back, which will distribute the weight differently. This baby carrier is slightly different from the Mei Tai carriers that have a more structured feel. It is made from 100 percent organic woven cotton. The back section which holds your baby is a soft material, allowing for your new arrival to be held in a natural snug shape. Without any structured padding, this carrier is like a second skin, holding your precious bundle closely comfortable to you. It also has an additional element of a drawstring seat, which encourages the ergonomic ‘M’ shape of your baby’s bottom and legs. With the drawstring adjuster, this Mei Tai will grow as your child does, allowing use from newborn to approximately three years. The straps can be widened for the user’s comfort and additional support too as the child gets bigger. A welcome addition is that the carrier has a hood for baby. This means you can provide shelter from outdoor elements, or use it as a cover during sleep. Thankfully, Didymos has made the material machine washable — shame you can’t wash out memories of a diaper leaking onto you from within a sling though! Can be used for different carrying types: front, back and hip. Available in a variety of colors and prints. Aids healthy positioning for baby’s hip joints. The light, airy material may not be suitable for winter months. Ideal for the warmer months, the body of the carrier is lightly padded for support, but is made from 100 percent cotton. The shoulder straps are wider than other carriers, and are padded too, for your complete comfort. Structured carriers are often perceived as the opposite of soft wrap slings regarding weight and general feel. But, surprisingly, the closeness and comfort of the Catbird provides a wrap-like feel. An element of this carrier which makes it a top-spot contender is that it can be used in five different ways. Variety in the way you can carry your child will not only benefit you, but your partner, and other friends and family who would like to try. Different positions allow for optimal support to the wearer, while providing entirely new perspectives of the world for your little one too. The size is also adjustable, and can be made larger or smaller, depending on the age of the child. Padded headrest included, which can be folded down when not in use. Can be used for petite wearers. Unlike other Mei Tai carriers, allows for outward facing. May not be suitable for plus size wearers due to waist and shoulder strap length. Not exactly being a size zero, “bounced back to beauty” post-baby mom myself, this Mei Tai was on my shopping list. 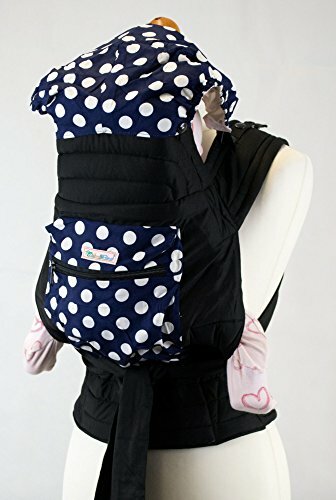 Like some of the others on the market, it actually has extra long straps, so you can secure your baby comfortably, no matter what your dress size. Just like many other Mei Tai slings, it has an adjustable panel height and width, to grow with your little one. Similar to other varieties, its waistband is padded for your comfort and the spreadable shoulders support weight distribution. Focusing on weight distribution, the preference of carry style with this sling is actually on your back. This can, however, be a complicated maneuver (speaking from experience) so it is better for older babies/toddlers who can hold their heads up and support themselves somewhat. This Mei Tai may seem simple in comparison to other slings on the market. It does only allow for two carrying styles, however, bear in mind that simple does not necessarily mean less useful. 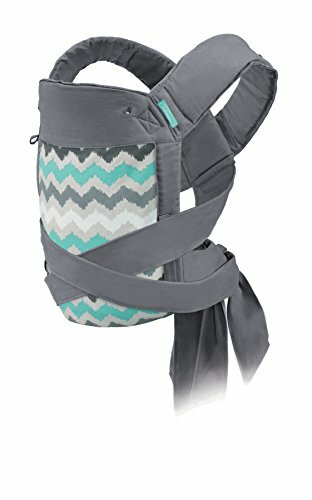 Despite my own problems in mastering a back carry position, this sling comes with an easy-to-follow instruction guide and has a good reputation for its ease of use. It keeps your child close and they’ll love being up on your back seeing the world from your perspective. Can be ironed — if you feel the need to give yourself an extra chore! Supports little spines, regardless of age. Can hold up to 33 lbs. Although advertised ‘for newborn use,’ their recommendation is from six to eight weeks old, depending upon personal judgment. The Infantino Mei Tai could be a great option available to you if you plan to use it into toddlerhood. It is one of the more structured carriers in terms of appearance and manufacturing , but it sure is sturdy enough to keep little tearaways in place! What makes it suitable for toddler use is not only its strength but also its straps. The four straps, one at each corner of the rectangular panel, are long. The straps help with older children and make it easy for other family members of different sizes to carry too. The straps are also well-padded for comfort. 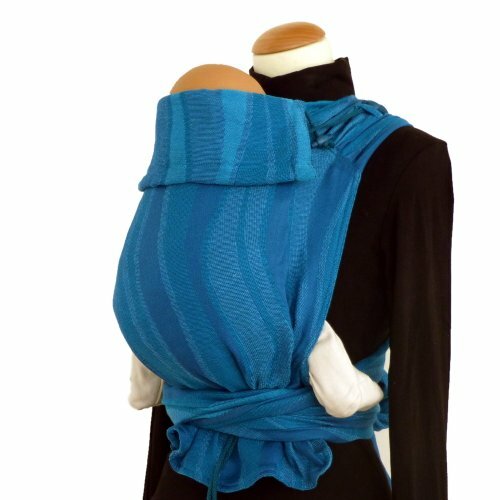 During a back carry, the Infantino wrap allows your toddler to sit in a lower position. This can be beneficial if you have a newborn in a different style carrier on the front of your chest. Something to consider, however, if you do like this sling, is that some moms with larger breasts have stated it is not suitable for smaller children in the facing inward position. Also, despite its durable potential, the carrier only allows for facing in, back, or hip carries. Comes in a variety of pretty prints. Will require adjustments if you do wish to use in the newborn stage first. Some users report it is bulky with too much material. Not so simple to tie with stiff straps. The growing popularity of babywearing means products are appearing to suit all budgets. If you are looking for your first sling purchase, you’ll probably want to have something that is simple, purse-friendly, and functional. If that’s the case, this carrier will be a great choice for you. No need to break the bank, but there is plenty of functionality in this carrier. When you start out slinging, your baby might not like it, or you may find that babywearing just isn’t for you and your family. Again, if you aren’t entirely sure, then a budget option could be best. Made from cotton, with built-in padding, it is comfortable for you and baby. It may be our budget pick, but it has additions which you probably wouldn’t expect. This Mei Tai allows for three carrying positions– hip, back, and front. It has a pop-stud detachable hood, is machine washable, and reversible. Yes, you read that right, it’s reversible! Forgotten to put it in the wash when the panel has a chocolate smear, compliments of your toddler? No problem — just quickly reverse it and wash it later. Includes a pocket to keep the hood in, or even loose change. Easy to use, comes with instructions and online videos for support. Carries up to 33 lbs. May be too padded for some personal preferences. It may be more suitable for petite wearers. We’ve covered so much here, but I am sure you will have a few questions surrounding babywearing. My motto usually is, “If you don’t try, you don’t know” and this certainly helped me with my decision to use a Mei Tai carrier with my second baby. Even though the benefits may seem wonderful for some, babywearing isn’t ideal for everyone. Of course, you may be wondering if it is the right thing for you and your little one. 1. Can You Still Use It If You Have Back Problems? You may have health conditions such as a previous back or spinal injury, and you aren’t sure if babywearing is safe for you. Some women require perinatal and postnatal physiotherapy for pregnancy-related problems. I was one of them. Not only did I need crutches in my pregnancies, I also required intense peri and postnatal physiotherapy, the use of pelvic support belts, and even kinesiology tape (source). I did wonder if my physio was just using anything to hold me together in case my entire lower spine gave up. This didn’t rule out slinging for me when my second baby arrived, but I did have to consult my physician following birth for advice. Most Mei Tai slings are designed ergonomically, with both your baby and you in mind. Baby’s weight is distributed evenly over the whole upper body and across both shoulders. But if you do have any pre-existing medical problems you think may compromise your health, give your consultant a call. I also made contact with online support forums for guidance (source). 2. Will It Increase the Chances of Separation Anxiety in My Baby? Part of me agrees with this common misconception, thanks to my slingy baby. I haven’t slept a whole night in almost four years — and I’m beyond desperate to find a reason now! I never used a sling the first time around, but did from birth to age three with my second. Although I can completely understand this statement, studies have found that this isn’t the case (source). Reduction in, and regulation of, postpartum anxiety in mothers (source). Assisting with breast milk production (source). Helping moms get their fitness levels back after the birth of their baby. All carriers should be assessed for safety. They come with instruction manuals, no matter how easy they are to use, and videos are available for reassurance too. There are specific guidelines which should always be followed when carrying. If you follow the correct advice, Mei Tai carriers are, in most cases, very safe for carrier and baby. Slinging seems to be everywhere now, and babywearing might even seem like a bit of a fashion parade. At least there are some pretty patterned slings to match outfits if you want to coordinate with your little one! If you do opt for using a Mei Tai, or any other baby carrier, make sure it is safe and secure. Find one that ticks all the boxes for your own use, as well as your baby. If you settle for one you aren’t happy with, the likelihood is, baby won’t be happy either. Just do whatever is best for you and your family. If you choose not to sling, then that’s OK, it isn’t for everyone. Not everyone chooses to breastfeed, not everyone agrees with co-sleeping — it’s all about you and your baby’s happiness. Give us a wave or pop us a comment, we’d love to hear your experiences or see any slinging pics! And if you know any parents wrestling with the idea of purchasing a baby carrier, please share this article with them.